Includes perimeter anti-theft alarm and adjustable pedals. Includes electrochromatic rearview mirror, auto headlamps, overhead console with exterior temperature and compass. Includes collapsible, covered storage unit that inserts into cargo area. Includes cigarette lighter and ash tray. Includes dual low-back, cloth captain's chairs. 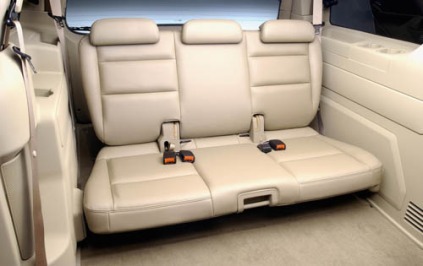 Includes ceiling-mounted screen, DVD player and storage, wireless headphones and rear seat audio controls. 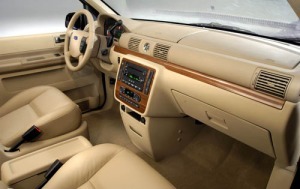 Includes AM/FM radio, cassette player and in-dash single CD player. Includes roof rack with crossbars. Includes panic brake assist, traction control with AdvanceTrac. Air bag system that deploys from headliner and covers glass to protect passengers in 3 rows of the vehicle. Includes front and rear side airbags. Includes front row floor console with storage. Includes trailer wiring, heavy-duty battery, High-Speed/Ambient Temperature Package, P235/60R 16 tires and mini spare.